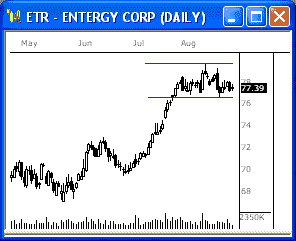 PTEN has formed a clear inverted head-and-shoulders pattern, which is a very bullish formation. 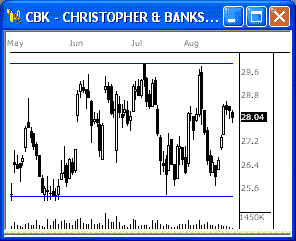 An upside break through 28.00 could spark big strength from this range. Also watch 26.00 for signs of continued overall weakness. HRL is breaking a steep lower trend line to the downside at 37.60, which is bearish. Watch for continued overall weakness from this stock. When looking at a stock to buy, we look to various tools and techniques to help us assess the probability of its upward movement. However, will it go up is not the only question to ask - we also need to analyze the chart to see how far it is likely to go up and also how much of a loss we are willing to take to allow it to reach it's profit potential. The potential profit of a trade divided by the potential loss of trade is known as the Reward:Risk Ratio. - Dow struggles in 11,300 zone, continues to wind up ahead of potential breakout. The index continues to hold above the near-term 11,250 support level, which we will continue to watch intently for continued weakness. - The NASDAQ and S&P each traded back and forth throughout the session and have widened their respective consolidation ranges. Watch for a breakout from these ranges for key movement. The Dow closed the day within the boundaries of a very narrow range precisely at the 11,300 fulcrum. The index continues to hold within a larger range, but a breakout from this range could lead to movement. Watch 11,400 and 11,250 tomorrow. CENX is winding up within the boundaries of a large, triangle range, that has continued to develop since June. Look for a breakout from this range for the next key move. Watch 37.00 up, and 33.50 down. 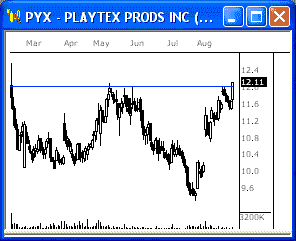 RYL is winding up within the boundaries of a clear triangle consolidation, which could spark a big breakout move. Watch 44.50 up, and 40.50 down for the breakout. - Dow finally breaks 11,300 support, begins initial decline. The index's break at 11,300 is the initial spark that could send the Dow back toward the 11,100 zone yet again. - The NASDAQ and S&P each sold off from early highs today and breached key support levels. These violations indicate that much more selling could be ahead. The Dow ended the day beneath the key 11,300 support level after getting a solid downside break from the consolidation early in the day. This violation could be the spark that takes the Dow down for solid 200 point decline. DPTR is getting a solid upside break through a clear upper trend line at 19.00 via a solid breakaway gap, which is very bullish. 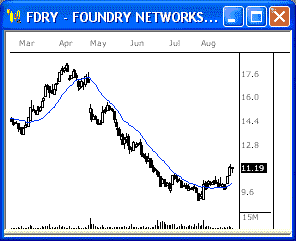 Watch for continued upside strength from this stock. NBR is winding up within the boundaries of a large triangle range, which is highly indicative of a pending breakout move. 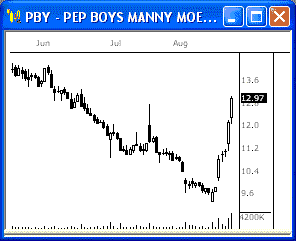 Watch 35.00 up, and 33.00 down for big breakout action. - Dow continues range movement within consolidation, breakout approaching. The index closed the day with a mild 5 point loss, but continues to maintain its stance above 11,300, which could bode well for an eventual upside break. - The NASDAQ and S&P each traded relatively quietly within the boundaries of their respective consolidations today. Look for continued build-up before a breakout is seen. The Dow closed another day within the boundaries of the very tight consolidation range that continues to form at the highs. Look for continued range movement ahead of the breakout. A breakout from this range could give us our next 200 point move. Developed by Larry Williams, the Ultimate Oscillator combines a stock's price action during three different time frames into one bounded oscillator. The three time frames represent short, intermediate, and long term market cycles (7, 14, & 28-period). Note that these time periods all overlap, the 28-period time frame includes both the 14-period time frame and the 7-period time frame. This means that the action of the shortest time frame is included in the calculation three times and has a magnified impact on the results. CONR is winding up within the boundaries of a very large triangle range that has continued to develop over the last five months. A breakout from this range will very likely spark big movement in terms of the next key trend. Watch 28.00 up, and 24.75 down. EDS is winding up within the boundaries of a clear triangle consolidation, which we will watch closely for a solid breakout. Watch 24.25 up, and 23.15 down. OA trading range is basically a horizontal channel in which a security moves from the high and low of the channel for an extended amount of time. Obviously, the upper level of the range can be considered resistance and the lower level represents support. Trading within a range is possible, but it's the breakout from the range that provides the best opportunities. - Dow pulls back from highs, trades sideways to the Close. The index closed the day with a 36 point loss, but continues to trade within the boundaries of the key consolidation that we will continue to watch. - The NASDAQ and S&P each traded slowly sideways today, as further development of their respective consolidations resumes. Look for a breakout from these ranges for directional movement. The Dow closed the day lower, but continues to develop within the boundaries of the key consolidation, which we will continue to focus on. Look for continued range movement until a solid breakout from this range is seen. Such a breakout could make for nice movement. FMCN is winding up within a large triangle range and took a breakaway gap down today. The stock is headed toward the bottom of the range and a breakout through 56.00 could spell weakness. FDO took a large gap up this morning, but immediately filled the gap to the downside to close the day with a loss. This exhaustion gap could be a precursor to big weakness ahead. Watch 24.50 for continued weakness. - Dow continues range movement at highs, resumes development of consolidation. The index gained 47 points for the day, but continues to honor the boundaries of the consolidation, which we will continue to watch for further developement. - The NASDAQ and S&P each reversed from early lows, but ended the day strong today. The tech-heavy index continues to wind up within its consolidation range; while the S&P is testing new highs. Look for continued overall strength above near-term support. The Dow ended the day within the boundaries of the developing consolidation. Look for more range behavior as the index gears up for the next key breakout move. A break back below 11,300 will give us an early signal of weakness next week.